The four clearly had a fun time preparing the album. JK joked, “It was Yoo Hee Yeol who told us we should have 3 title songs. If we were successful, then it’d be thanks to Yoo Hee Yeol. If we failed, it’d be his fault.” The studio responded with laughter. JK continued, “We were in Billboard overseas, but no one knows about us here in Korea.” More laughter ensued as Yoo became embarrassed. Amongst other highlights from the show, Yoo introduced Tasha as Korea’s top 3 female rappers (YoonMiRae, T, and Jordan’s mom). It’s something Tasha finds flattering, but burdensome as an expectation. JK gets jealous when he hears Tasha praised so highly, and she uses it against him. Apparently, when he’s angry, he tends to rap better. The full Yoo Hee Yeol Sketchbook episode will air Apri 3rd, 12:15AM. Tiger is the first to be introduced, but rather than elaborate on himself, he introduces his wife, who is a first time guest on the show. They briefly discuss their relationship and share how the magic is still alive within it. Tiger comments that she still feels like his girlfriend, and Tasha not knowing what JK said, comments similarly that she still doesn’t know the difference between being in a relationship versus being married. When it comes to Bizzy, JK said without him, JK wouldn’t be able to do what he does. However, there are still many who don’t know who he is. 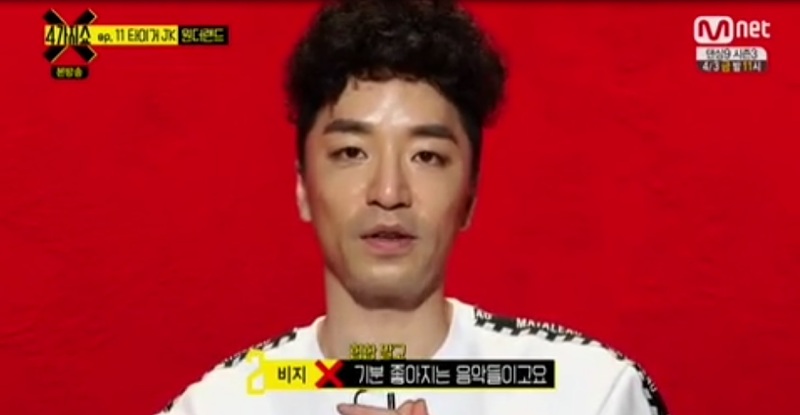 When asked how he got his start, he revealed he’s been rapping since fellow rapper, Yang Dong Geun’s (YDG) 1.5 album. That was nearly 12 years ago! 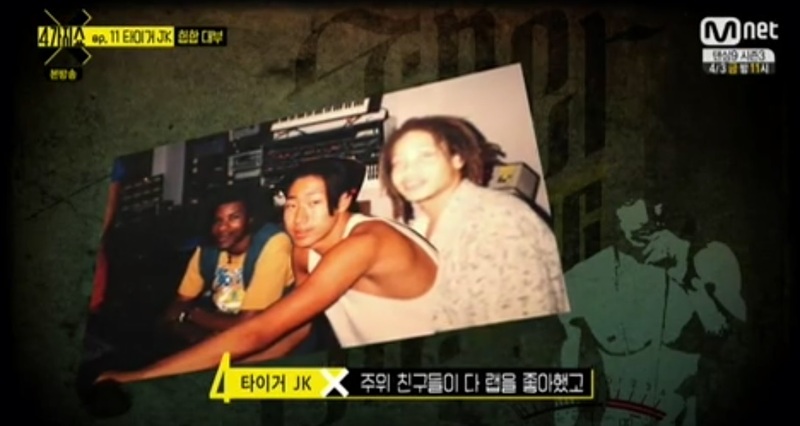 He was still learning from YDG, who ironically was mentored by Drunken Tiger, and JK decided to help. Ever since 2004, Bizzy’s performed alongside JK and Tasha, but ironically people still have trouble recognizing him. 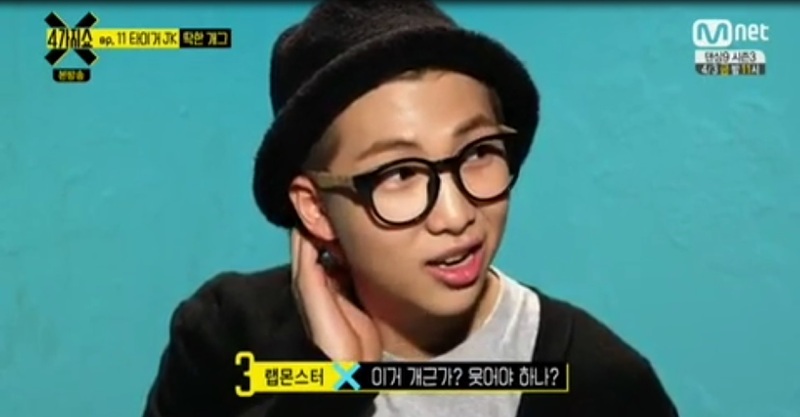 Rap Mon is then introduced, but this is his 3rd time on the show. He’s most famously known as BTS’ leader, but he was an underground rapper prior and grew up idolizing JK. As seen on his last appearance, people questioned him on why he joined a boyband. He vowed to change the views of these critics, and flash forward, he has a solo hip-hop mixtape and this collaboration with MFBTY. Is JK the Godfather of Korean Hip-hop? JK elaborates on how he started, stating he got into hip-hop culture through his friends, and it wasn’t something he saw as a career for himself. He liked the culture even when others didn’t understand it. However, he was picked up by Oasis Records after he performed at show, and later came out with his first actual album, “Call Me Tiger.” He formed Drunken Tiger the group 5 years later with then partner, DJ Shine, and the album was a breaking point for hip-hop culture. However, Korean culture still couldn’t grasp the concept of it. Nevertheless, Drunken Tiger is credited for bringing the culture into the mainstream, but it’s not something that JK likes to talk about. Korea was already doing some hip-hop, but because DT brought many cultural elements into the mainstream, he’s been labeled Korea hip-hop’s godfather. This puts an unexpected pressure on him to live up to a certain image. We’re next taken into a mini tour of Uijeongbu, a small city outside of Seoul that MFBTY calls home. Tasha and her family have lived here for many years, and she admits that Tiger moved there for her. She describes Uijeongbu that is a city that has the peace of the suburbs. At night, the nightlife is booming, but in the daytime you can hear farm animals and see beautiful mountains. Around the neighborhood, there’s multicultural restaurants and Tiger even makes a visit to a braiding shop that his wife recommended. JK video calls her and his son from the shop. Tasha catches the stylist (who happens to be her own) and reveals that JK is sensitive and might cry if his braids are too tight. Inside the Feel Ghood Music office/studio. The new Feel Ghood Music office is referred to as a time capsule. The common area is filled to the ceiling with vinyls that the group uses for inspiration, and there are no windows to minimize distractions. When they are in the studio, they get caught up in their music and it’s easy to lose track of what time of day it is. Tasha refers to it as a black hole that is easy to get stuck in. Tiger and Tasha flirting on set. 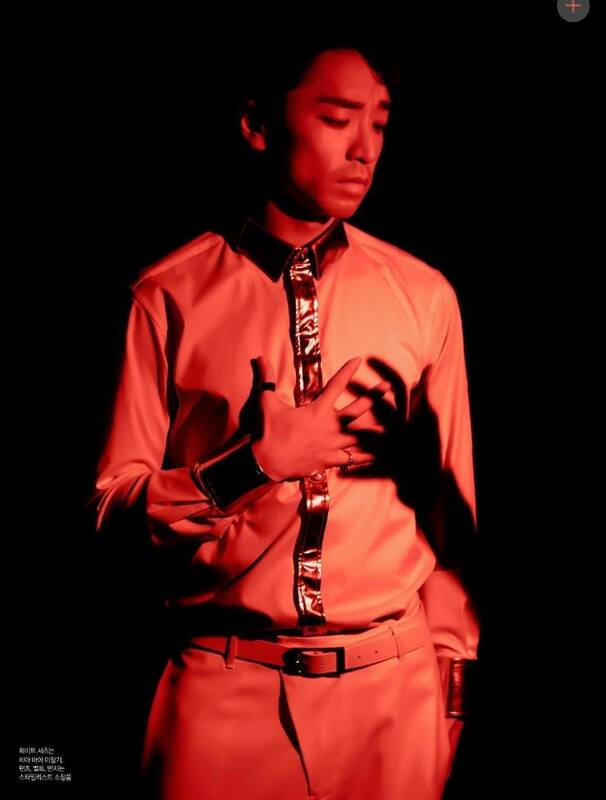 As the trio prepare for the Hello Happy music video shoot, Tiger is seen dancing to Childish Gambino’s “Sober,” and the result is almost similar to the music video. Tasha is initially unphased by JK’s woo’ing dance, but after stringing him along, she jumps into dance with him. Tasha comments that JK has sacrificed so much for her. No matter how sick he is or how tired, he would do anything to make her happy. 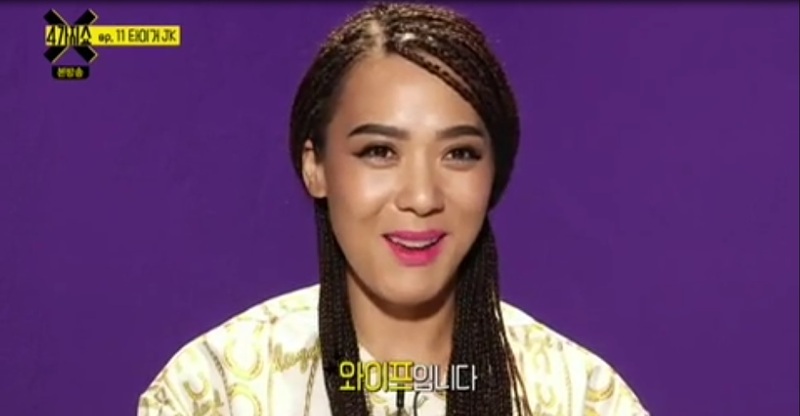 Bizzy reveals that JK is the one who has “aegyo (cutesy act)” in the relationship, not Tasha. However, their relationship is like a match made in heaven. We’re taken back to when the group filmed their “Bang Diggy Bang Bang,” video. Tasha is missing from the room, and JK and Bizzy stand in awkward silence. JK says that without a script and without Tasha, both he and Bizzy are useless. Rap Monster arrives a few minutes later without knowing MFBTY is in the middle of filming for 4ThingsShow. 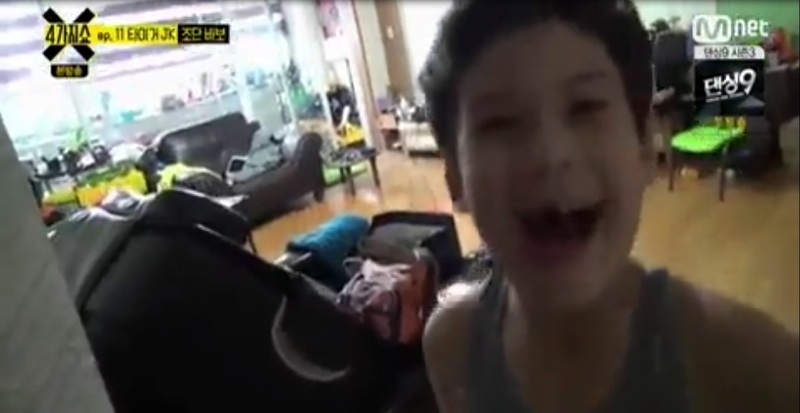 He is caught off guard at first, but tells the camera that Tiger JK is his idol. JK replies, “You’re my idol (play on words).” JK comments that Rapmon changed his view of idol rappers. 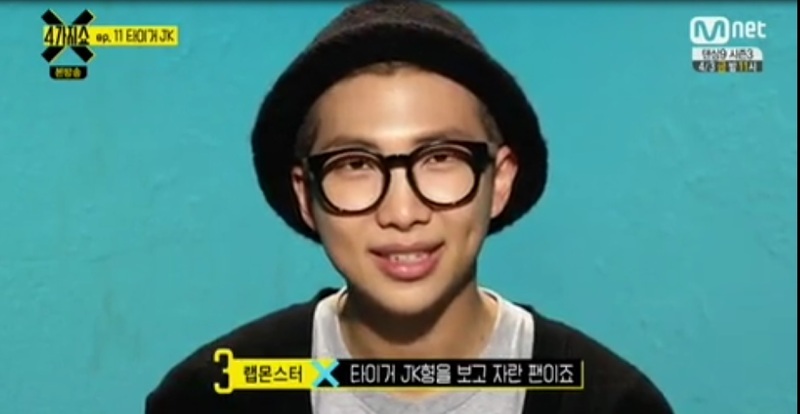 Rapmon’s good-natured personality and natural skills rapping left a positive impression. RapMon recalls hearing Tiger JK get jealous. However, it wasn’t always positive between RapMon and JK. 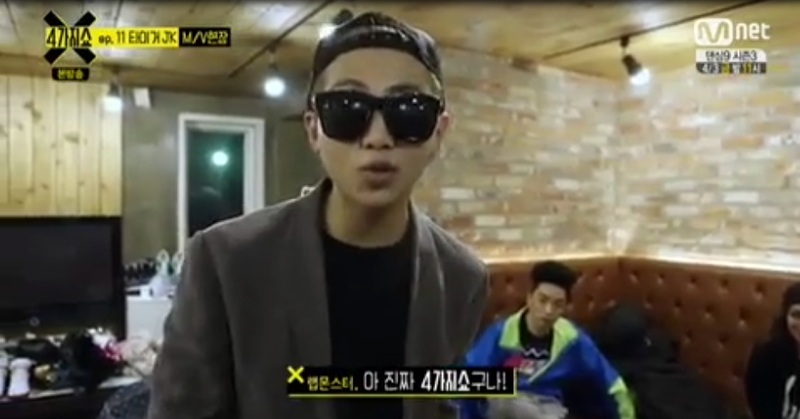 JK recalls that in the studio, RapMon took off his shirt and left only his undershirt on. JK was worried RapMon was trying to get a glance from Tasha, and it didn’t help that Tasha was being friendly to him. This didn’t sit well with JK and he said, “Your face changes when someone younger comes.” A small argument between Tasha and JK followed. This occurred in front of RapMon, who commented that he could see even through an argument, they truly loved each other. Jordan closes in on dad’s camera. 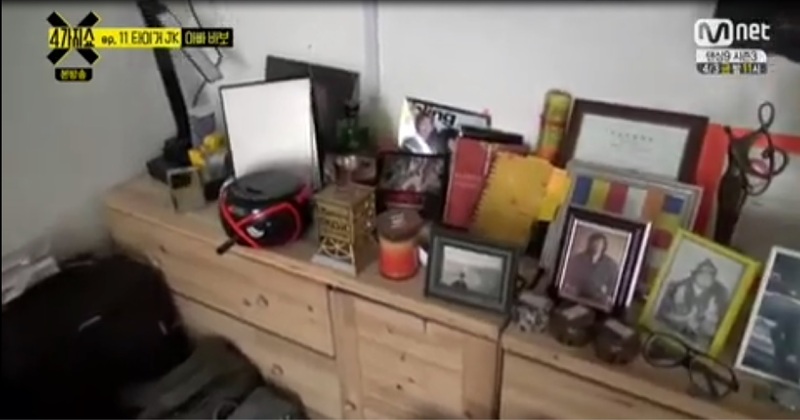 Suh Byung Hoo’s (JK’s father) room remains in tact a year after his passing. To this day, JK tries to put on a strong face in front of his family, but Tasha can hear him crying in the bathroom sometimes. JK misses his dad. However, rather than think of those months as a painful time, he takes what good he can: “During that time, the world felt so cold, but when I look back, I think of those last 7 months we had with him as a beautiful time for our family. We held his hand while he slept, shared meals with him when he was hungry.” His family hardly left his father’s side. JK honors his father’s memory as much as possible. The necklace he wears now is one his father gave to him. JK is postponing cutting his hair because his dad would touch JK’s hair when they would talk to each other. Everyday he asks Tasha if he should cut it, then tells Tasha he’ll cut it tomorrow. Tomorrow still hasn’t come. JK says he feels his father’s presence and hears his father speaking to him. In return JK writes to him hoping to “hear” a response. 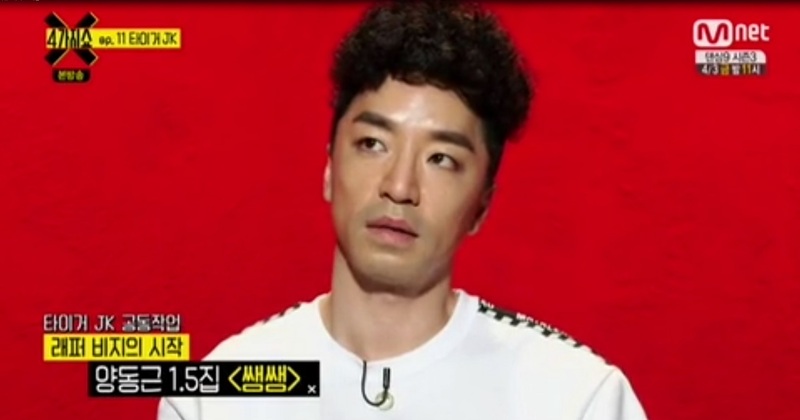 It took 10 months for MFBTY to fully come back to music. The release of “Angel” (under YoonMiRae’s name) in December marked their first single back, and it soared to #1 quicker than expected. The song was about everyone being an angel for someone, and there are angels there for you during your hard times. Clearly, it had elements inspired by their experience that past year. Making the song wasn’t about making a hip-hop track, it was just about making a song that felt good (thus Feel Ghood Music). Returning as MFBTY fully 4 months later was hardly any different. The “Wondaland” album was meant to be free of genre, as it had elements from all areas. Even RapMon commented that when he heard the album, he didn’t need to know its “meaning.” It was just a new sound. While critically acclaimed (check their recent review in Billboard Magazine), the name caused them some problems. “It stands for ‘Mother Freakin’ BizzyTigerYoonMiRae,’ or ‘Miss Fat Booty,’ or ‘My Fans Are Better Than Yours,” JK says. However, it’s not the meaning that fans take issue. “It’s not that hard to say!” Bizzy says in response to a question about the pronunciation. JK is then asked to reflect on himself. He refers to himself as “Old Tiger” now. Unknowing to him, Tasha says JK still seems the same age to her. The show ends with 4 messages JK is to keep in a time capsule to be opened in the future. One message is for his father, one saying “Tiger JK is here,” one that we can’t make out unfortunately, but the last one appropriately written: Love, Peace, & Harmony. 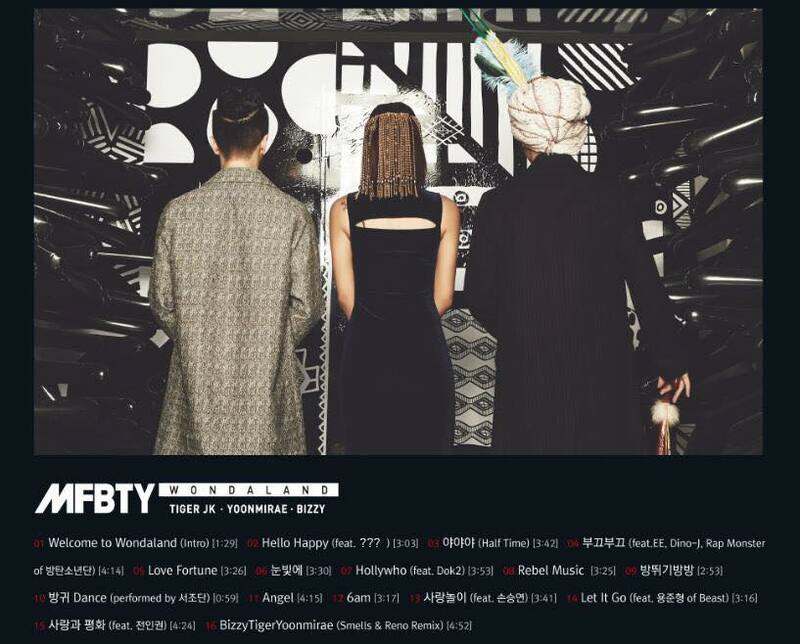 The project group, MFBTY, revealed the title of their new album is called, “Wondaland,” a tribute to the name of the cult fanbase before MFBTY became a group [see history]. The countdown to MFBTY’s “Wondaland” begins now, with only 7 days to go. 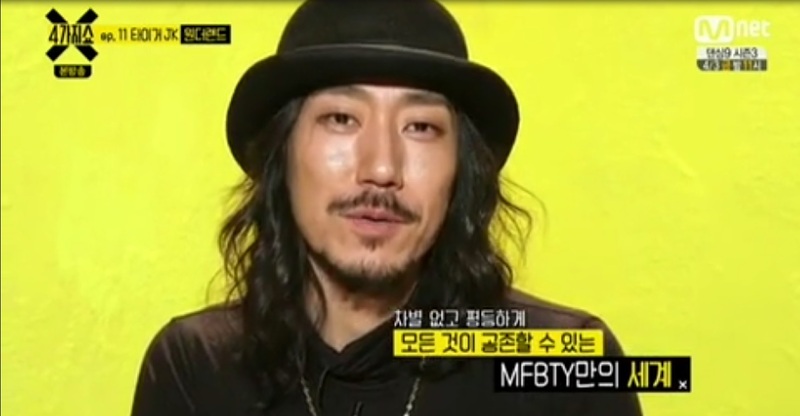 MFBTY promises that the album will include a variety of exciting music. Their label, Feel Ghood Music, revealed the album jacket, track list, and album title today, March 12th. The photos have an atmosphere of excitement, diversity, and 3 people with healthy energy. The three members sit on a couch in a colorful look, sunglasses, and with a casual attitude. Hip-hop royalty Tiger JK, YoonMiRae, and Bizzy have a charismatic tough look that attracts your attention. “Wondaland” will be fully packed with a total of 16 songs. It will feature rock legend, JeonInKwon of DeulGukHwa, rapper Dok2, Windy City’s lead vocal and guitarist Kim Ban Jang, electronic duo EE, next generation diva Son Seung Yeun (The Voice Korea), idol producer Rap Monster (BTS), and BEAST’s Yong JunHyung. The album will also introduce Feel Ghood Music rookie producer and artist, Dino-J. The line up is extremely colorful and random, yet will give the album a feel of complete satisfaction. 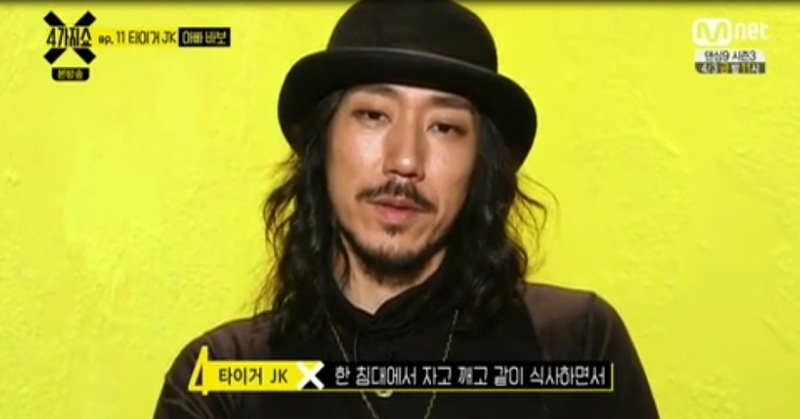 A surprising track that was included was the song, “Fart Dance,” made with Tiger JK and YoonMiRae’s son, Jordan. Audiences should expect to be surprised by Jordan’s cute singing. “Wondaland” will release March 19th both online and in stores. The album will be sold at Kyobo Hot Tracks, Interpark, Aladdin, and most major online download sites (Safe to assume Itunes as well). Some online distributors are already taking pre-orders.